The Democratic Party Caucus is meeting tomorrow, April 13th, 2008. CREED, a long-established California-based environmental organization, has requested suggestions for questions regarding proliferation of both nuclear weapons AND nuclear power plants. Hopefully, the questions will be later asked of the various candidates of BOTH parties. Below are my suggestions, and contact information so you can send your questions in, too. "Given the overwhelming evidence of 'linear, no threshold' damage from radioactive particles in the environment, when do you intend to replace nuclear power with environmentally-benign energy sources such as wind power, and nuclear weapons with environmentally-benign weapons that -- no matter how horrible their immediate destruction may be -- at least do not continue their destruction for generations after the war? Better yet, will you place a greater emphasis on peace negotiations than President Bush, who instead, forces other nations into war, and causes nearby nations to quiver with fear and decide to 'go nuclear,' as Iran is doing?" 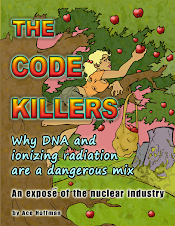 "Considering that our worst fears about the dangers of low-level radiation, the dangers of proliferation, the dangers of accidents, and the dangers of terrorism are now being proven correct, both through epidemiological studies (that is to say, scientifically), and through world events such as 9-11, how do you intend to replace coal, oil and nuclear energy with alternative, clean, energy sources -- sources which are certainly up to the task, but have met with political roadblocks and financial disincentives instead of the encouragement they need and deserve? Will you be different?" "Since no private investment group has EVER decided to invest enough money in nuclear power to build even ONE nuclear power plant -- EVER -- without enormous government subsidies and tax breaks, will you pledge that your administration will cancel ALL investments in this money-losing technology, including canceling Price-Anderson so at least these behemoths have to pay their own way when they shop for insurance? Will you recognize the overwhelming scientific evidence showing that nuclear power is dangerous, dirty, inefficient, susceptible to terrorism, and, above all, destroys the democratic principles of this country because it is so secretive and so centralized, and in many cases, so poorly run? Aren't you sick of nuclear proponents who are so sanctimonious they won't even admit that children, infants, and fetuses are far more harmed by radiation than you or I? "Since Yucca Mountain is opposed by virtually everyone in Nevada as well as their elected officials, as well as by millions of people along the dangerous transportation routes, and since the science behind or underneath Yucca Mountain has not passed 'peer review' and is known to be flawed simply because it makes too many wild assertions about what the future holds to be anything else, and since there is no other possible cleaner way to handle nuclear waste from either nuclear weapons or nuclear power, and since every milligram of radioactive waste is not only in itself a serious health threat, but also has a significant cost associated with protecting the environment from it for thousands or hundreds of thousands of years, are you going to be the American President who admits the failure of an entire concept: That nuclear power is as much a failure as nuclear weapons, and that both have only brought the world misery and despair, lies, cancer, leukemias other health effects, and to the brink of financial ruin? Are you strong enough to be rational about this?" >Please forgive duplicate reception; this Alert is sent to ALL CREED ALERT lists. CREED steering group development of a short question on NUCLEAR PROLIFERATION is underway, for use by presidential election campaigners of any political party. It will be revised to an expanded statement on the complex issue. Your participation is welcomed. tomorrow, April 13, at 3 p.m. (go to www.cadem.org for more information). nuclear power generation, is twin domestic and international, it should be a major issue in all political party presidential campaigns. tomorrow, please respond to this email, immediate reply email or 949 492 5078.
to our CREED lists for substantive and editorial comment. ... And let's try to help in Hawaii, too! Given the specialized knowledge needed to accurately assess and remediate DU hazards, and the level of public concern, we feel an independent perspective is called for. The resource people we recommend are Lorrin Pang and J.D. Thompson. Dr. Lorrin Pang of Maui is a physician who served 24 years in the Army Medical Corps. He was also a World Health Organization consultant. He is now district health officer for Maui County, but speaks on DU as a private citizen. J.D. Thompson of Pahoa has a Ph.D. in Biophysics from the University of Wisconsin, Madison. He retired from the Department of Physics, Augustana College, Sioux Falls, South Dakota, where in addition to teaching physics, he was the Radiation Safety Officer for about 25 years. He had radioisotope training at Oak Ridge, Tennessee. We also hope your briefing, and your report to be released to the public, will respond to our unanswered letters of November 18, 2007 and January 15, 2008.